A pet is a friend, like a family member so it is very important to keep them healthy. Phuket Animal Hospital , a full-service Animal Hospital in Phuket, we are pleased to provide skilled care for your pets; dogs, cats, birds, reptiles, and any pocket pets. 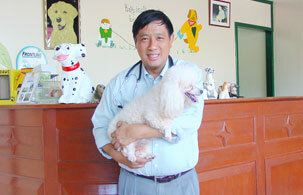 At Phuket Animal Hospital our mission is to provide the highest standard of quality and compassion in veterinary care by professional veterinarian. 09.00 A.M. - 07.30 P.M.